I was wondering if there is a picture of the 31st Indiana Infantry Regimental Band (Civil War), and, if so, where I might obtain a copy of it. My husband's Third Great-Grandfather was in the band. The Genealogical Society of Marion County will meet on Saturday, October 12 from 1 to 3 pm at the Wayne Branch of the Indianapolis-Marion County Public Library (198 S. Girls School Rd., Indianapolis IN 46231). Lee Cloe, E.D. will give a program, "Chasing The Scots," about researching Scottish genealogy. The program will include a short history of the 5 peoples, 3 regions, 3 religions and 2 philosophies that make up Scotland. Submitting a query to IGS can be like "crowd sourcing" your research. An example is the following reply to our Baker query below. Our Rush County ICG Pam Steed enlisted a cohort Susan Huston to do some digging, and Bill Baker may have a new research line to follow. Good going to our IGS "crowd!" Your query to Ron Darrah regarding your ancestor, Stephen Baker, has made its way to me to try to assist you in identifying Stephen's parents. From the website FamilySearch.org, I was able to obtain the 1870 census, which I have attached (email). My interpretation of the data is that Stephen was born in Kentucky. It appears from the names and ages of the others listed in his household, that Stephen lived with his wife and son as well as a person who could well be his mother (Catherine, age 56, b in Kentucky), a sister (Cordelia Williams, age 18, b in Kentucky) and a niece (Ida Belle Williams, age 1). A suggestion for further research would be to track Catherine and Cordelia. 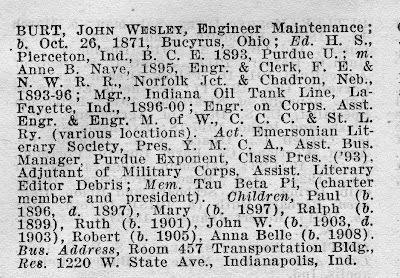 Looking for information on Stephen McNeal Baker, my great-grandfather. He lived most of his life in Rushville, Indiana, (born in New York) but spent the last few years in or near Anderson. 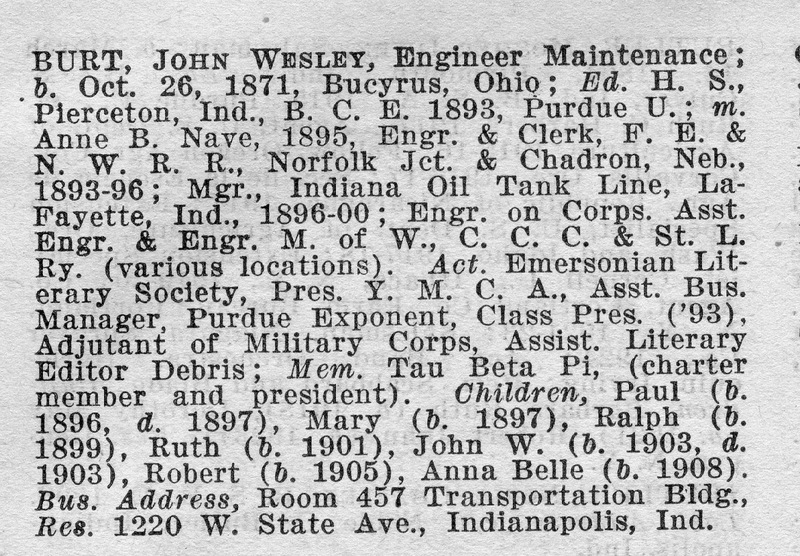 According to his obituary (published in the Rushville newspaper) he died at his home in Anderson on 30 October 1897 after having been sick for some time. He is buried in a small country cemetery near Rushville. After his death his wife, Isabel, returned to Rushville. I've been to the Anderson library and looked through the Anderson 1897 newspapers but can't find any notice of his death. I've visited the Anderson Health Department and they don't have any record of his death. The Rush County health department doesn't have any record of his death either. So, I was wondering if there was a local genealogist who might be able to suggest other places to look for information concerning Stephen's death. I was hoping to find a death certificate or other document that identified who Stephen's parents were, which is my brick wall. Thanks. The Northwest Indiana Genealogical Society will meet on Saturday, November 16 at 10 am at the Valparaiso Public Library. Lou Szucs will present a program on how to get the most out of Ancestry.com. We are getting very close to having a minimum of five databases per county in our County Records section! After surveying what is now on line and what is currently in the pipeline, we find that there are only six counties still in need of an additional database. These counties are Crawford, Floyd, Harrison, Martin, Newton, and Pulaski. Just attach your file to an email--or even send in a hard copy! Send the file to our webmaster; the address is on the IGS website. We thank you for your support. The LaPorte County, Indiana Genealogical Society will meet on Tuesday, October 8 at 7 pm at the LaPorte City Parks and Recreation Department building (250 Pine Lake Ave., LaPorte IN). Mary Jane Novak will present a program on tombstone rubbings. The Genealogical Society of Marion County, in cooperation with the Indiana Historical Society, will hold their 17th annual genealogy conference on Saturday, November 16 from 9 am to 5 pm at the Eugene and Marilyn Glick Indiana History Center (450 W. Ohio St., Indianapolis IN). Joan Hostetler of Heritage Photo and Research Services will be the featured speaker, and the conference theme is "Photographic History, Preservation and Archiving." The day will begin with a session on the history of photography - everything from daguerreotypes to digital images. Hostetler will then share tips on how to date the image based on the photographer, format, clothing and hair styles, vehicles, and other props. After lunch, she will explore important preservation factors to consider such as safe storage environments and materials as well as how to properly mark photographs. In addition, Hostetler will address pertinent questions on how to create a family archive: Should you use boxes or create an album? Is it a good idea to place images online? What are the best ways to share photographs with family? What if there are no family photographs to be found? How can local historical societies be of service and should you consider donating any materials yourself? The day will conclude with Hostetler viewing attendees' photographs and helping to demystify them. Registration for the conference is $32 for GSMC members and IHS members, or $40 for non-members - it includes lunch, free parking, discounts in the IHS bookstore and access to IHS exhibitions. For members who register before October 15th, it is only $30. For more information, including how to register, please download the conference flyer (PDF). I will be visiting the Lafayette-Attica area in mid-October, 2013, and hope you might have suggestions for finding out more about my great-great-grandfather FRANK SCHULTZ (1830-1904). His son George Schultz is my great-grandfather. Frank farmed in the Wabash River area west of Lafayette (Independence, Pine Village, Riverside). Thank you for anything you can tell me. NOTE: This database also includes digital files of each entry from the alumni directory, with information on birthdates, spouses and children. The Indiana Genealogical Society now has 1,137 databases in the Members Only area. Each of Indiana's 92 counties has at least 4 databases. Read in Biographical History for George W. Stevenson which mentions his father, Joseph Stevenson, born 2 June 1786, died 13 August 1826. He lies buried near the old Elkhorn Church. Did his body get moved to the Elkhorn Cemetery (unable to locate his gravesite)? Joseph Stevenson was one of the early pioneers of Wayne County. There is also a reference to a book he wrote regarding his hatred of slavery that prompted his removal from Maryland. Any ideas?